We hoped you liked reading Why I Don’t Use FIP by Andrew Fox! You should feel honoured if Tom Tango rips this on his blog. His usual response to this kind of complaint is that FIP isn’t meant to predict ERA. FIP is a stat of its own, to be used like K/BB, GB%, whatever, and supplemented with additional data. Sure, it’s scaled to ERA, but that part is just to make it easy to understand on it’s own without comparing multiple players. 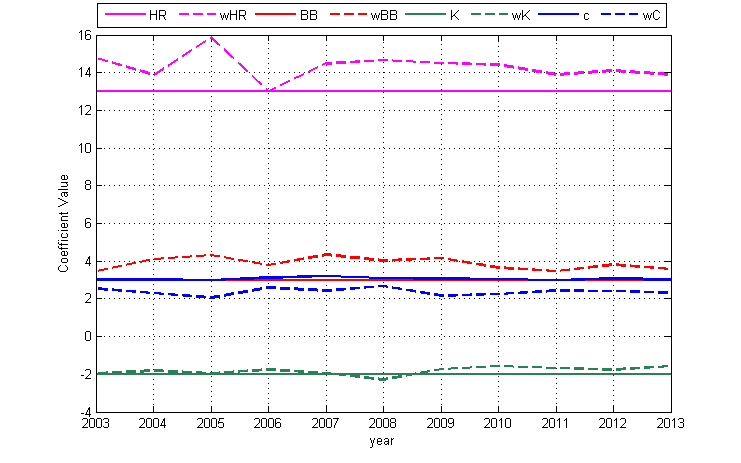 Nobody complains about wOBA not being a perfect estimator for OBA. They are completely different stats. (wOBA is another Tango creation). Thanks Andrew, this article is fantastic and necessary to keep advancing the tools we use. I can’t stress enough how important it is to understand the bias and limitations inherent in a tool before putting it to use, in this case making conclusions. The problem with that statement is that FIP is not comprehensive. It intentionally ignores a large amount of information. Great article Andrew. Hopefully it is at least the catalyst for some change in the way FIP is calculated. Our of curiosity, what do you use to evaluate pitchers? SIERA? You consider simplicity to be a poor excuse for keeping integer coefficients, but I find this is one of the best parts about FIP. I use baseball-reference to look up players and stats much more often than fangraphs and the integers make it a relative breeze to calculate in my head, only slightly harder than batting average would be. I realize most are probably not using it in this way, and I applaud your efforts to improve something you see as lacking, but FIP’s simplicity is part of the reason why I even use it. The integers are only part of the mental math though. You also have to do a division by IP. If you can handle dividing by an inning total like 187 in your head and getting one or two decimals of precision for FIP, then you can probably also handle a decimal or two on the HR/BB/K coefficients when you do the multiplication.